Posting vignettes based on great postcards found in my mail box and elsewhere. Being a member of Postcrossing, is a wonderful way to meet and greet other postcard collectors (or accumulators, as some would say). The project is quickly coming on 20 million post cards sent and received. I have just passed 300 cards sent and 300 received. This latest card was sent by Esjr (Ester in English), from Holland just outside of Rotterdam. 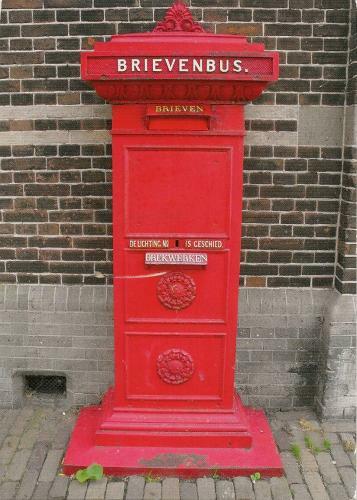 This image of a red postal collection box is striking. I like it because it draws attention to a mundane thing, something we might see each day but think nothing of. How many things do we "see" and not really see? Esjr is a postwomen so she is very familiar with these red boxes. She also told me she has three children and loves to ride her motorcycle. Her profile picture, a bit too dark for much detail, shows her straddling her motorcycle in a knee-length black coat. Her legs are bare and her toes pointed to reach the ground. Seeing great post card images and reading but a few details about the people who send them sometimes will inspire me to write a poem as I did here. ready to receive orders, even desperate news. and stacking them just so into your shoulder bag. and frail news from this hard, hard world. You can find more of my poems at my poetry blog, Fresh Bean Sprouts. Food storage is important if you want to eat after the growing season ends. Most people in the developed world have freezers and refrigerators. Their food is kept for them in warehouses until they do their weekly shopping. 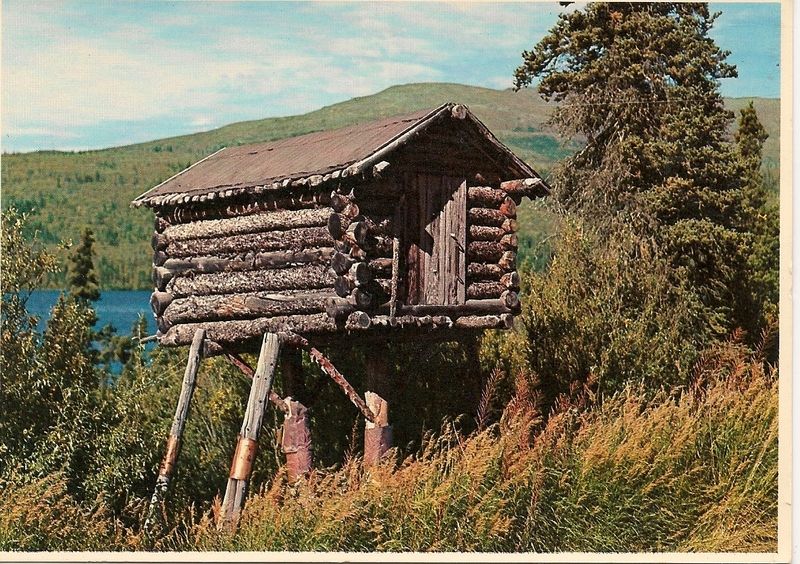 In less developed areas, like bush Alaska, people must store their own food and so they rely on a food cache. These are often built on stilts and some sport sod roofs which help keep them cool in the shoulder months before and after winter. The stilts make these structures more difficult for bears to get at the doors. 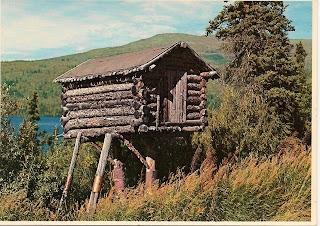 For the most part the cache is used to store caribou or moose meat over the long winter months. This post card image of a cache near a body of water is not specifically identified. The photo was taken by Mel Anderson for Alaska Imp Prints, which does not have a web presence. It was distributed by J&H Sales of Anchorage. My best guess is this card was produced in the 1970-80s. This photo postcard makes me think how goofy all ideas about the future really are. Of course we don't know what the future will look or feel like because our ideas are, as always, locked in the assumptions of the present. The future tends to pass us by, especially our technology. Perhaps if we could time travel we might be able to go forward into time and see the future but then our own travel to the future would alter the past and the future simultaneously, so that might preclude us from knowing the future especially if everyone wanted to travel to see it and of course they would. So time travel might not work as a way of smoothing out the journey. Then too, there is the issue of acceleration. The speed of change is increasing exponentially. How can anyone keep up with that? No one has a clue of what might happen? In a way, we're all dumb animals running into the street without the slightest idea that a car could come along, strike and kill us. We learn very slowly. I suppose you could say this fatal ignorance gives life its poignancy. End of pondering our species limited knowledge. 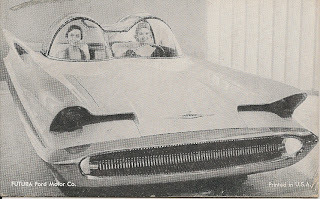 Now the short history of the postcard car. 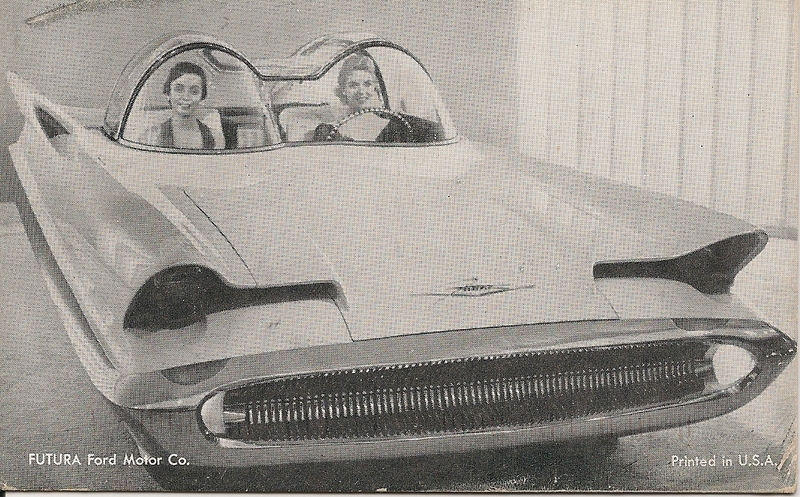 This was Ford Motor Company's car of the future. Somehow the future arrived and passed this winged monstrosity behind. The car here looked a little like an Edsel on steroids, another Ford dinosaur. They called the car the Futura, not to be mistaken for the Ford Futura produced for the Australian market between 1962 and 2008. That car was a BF Series Ford Falcon, a much smaller car that morphed into the current Ford Fusion. The model shown here looks like what an engineer in the 1960's would think the future would look like -- sharp lines, wings, wrap-around chrome and big -- gas guzzling behemoth. It never made production, fortunately. Thanks Rick B. for the great postcard. Yes, I think it will be a "smash hit." "After Paula died I began to send her mother postcards. The first card was the hardest to send. I was afraid she would think it wrong to write about death on a postcard. I hope she understood that what I really wanted her to know about my feelings was in the face of the man on the card, not in the words themselves." --from Kenneth S. Brecher's, Too Sad To Sing: a memoir with postcards. so that what is past occurs in full light?